The so-called slight mound on which the eastern recumbent tone is supposed to rest. There are undulations -- up and down by around 10 cm -- but this degree of surface roughness is no greater than that seen right across the site. The "slight mound" mentioned by Dyfed Archaeology was not beneath this stone at all, but beneath the western recumbent stone which we see in the distance. Below I have copied in -- without any editing at all -- a commentary on MPP's talk to the National Park Archaeology Day on 17th Nov, written by a member of the audience. I'm very grateful to him. MPP led us through a rapid list of works in North Pembrokeshire: the Roman villa, Banc Ddu, and Dryslwyn (should that be Pensarn? ), before ending with Waun Mawn in a thrilling performance. The Waun Mawn segment started with a reference from the RCAHMW published in 1925, from a visit to the site on 18 June 1914. Within this is the sentence “ the surface of the common is much broken up by turf cutting, which has evidently obliterated traces of further stones of the circle, though it is probable that a further examination would reveal their positions.” It is curious that there is no apparent evidence of peat extraction over this area to be seen today. MPP didn’t dwell on this subject at the time, but drew attention to HH Thomas’s discoveries in the years afterwards and how we were lucky that they had not drawn the obvious conclusion that we have with this site. The significance of the digging on the moor did not become apparent until the end, when there was a question about this disappearance of the peat across the site. MPP said this was due to the digging mentioned in the Royal commission. I not sure there is any evidence of peat digging on the ridge, it could be possible down in the col to the south. As a reader of this blog, any digging at Waun Mawn immediately calls to mind the quarrying to south and northwest of the site. I suspect any peat here would have been extremely thin. MPP pointed out that the name means ‘peat moor’. The site is however close to the summit of the ridge, Cnwc y Hydd, or the Stag’s Knoll. How much of a tradition of peat or turf cutting was there on Preseli? Evidence for the stone circle is not strong. MPP marked up seven (I think) stone holes excavated. Two images of holes were shown, which were very convincing, although possibly small – it is difficult to tell in the lecture. 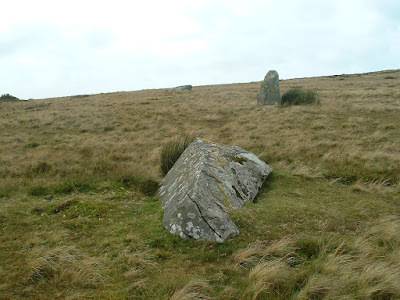 We were shown a hole for the easternmost recumbent stone, which looked very dubious, but was obviously suffering from the effect of the weather. There may well be better evidence for this. I think this was the area of ground repaired by DAT in 2007. One interesting facet is that all the material in the holes has been sieved to retain any stone chips to be examined for petrological evidence. We may have the start of a Waun Mawn debitage thesis to match the one from Stonehenge. A range of large stone circles were outlined – Long Meg, Ring of Brodgar, Avebury, etc. Waun Mawn may be the third largest stone circle in the British Isles. While looking at these plans it was pointed out that some of them have gaps where stones should be, so why couldn’t Waun Mawn have equivalent gaps? I have gaps in my teeth, does that make me related to a certain film actress with gaps in her teeth? A disclosure during the talk is that the easternmost recumbent stone sits on a small mound, possibly make it more distinctive. The final slide shown had Waun Mawn superimposed on a drawing of Stonehenge phase 1. This gave the tantalising suggestion that from the centre of the supposed circle to this mound is an alignment to the Midsummer sunrise as happens at Stonehenge. The conclusion was that more digging was needed next year. There was no mention of where the stones went, or of other such similar matters. The audience were not looking for this aspect of the story. The site location slides happened to show Rhosyfelin, Carn Goedog and curiously, Cerrig y Marchogion along with the other sites, but they were only mentioned in passing, if at all. The synchronicity of events in radiocarbon years after 3000 BC was pointed out several times. There does seem to be a lot of activity around this time. It would be interesting to look at an analysis of radiocarbon dates of the region now that there are starting to be large numbers of them. Top marks for an interesting, well presented talk that ran through all the various sites and episodes in North Pembrokeshire. it will be very interesting to look at the detail in the specialist studies as they come out. So yet another bravura performance from our old friend MPP, in front of an audience not particularly inclined to question anything. One has to admire him for sheer brass.......... and so the hoax rolls on, getting ever more elaborate. 1. The comment from RCAHMW about peat cutting is, I think, nonsensical. For a start, there are no traces of peat cutting here, because this is not a blanket bog area. As NRW and the National Park have noted, this is an area of dry heath, and the soil horizon here is just the same as the soil horizon in many other parts of Preseli where the slope is quite steep and where there is good surface drainage. I have published some images showing what it is like. Secondly, if there had been peat cutting here (in other words, if the surface had been lowered), it would not have obliterated traces of any ancient stone circle -- it would have made them more obvious. (There are some signs of peat cuttings on Preseli, especially near Foelcwmcerwyn -- and they are pretty obvious to anybody who walks over them.) It may be that some of the quarrying traces on Waun Mawn and Cnwc yr Hydd were mistaken for peat cuttings, by people who did not examine them properly. 2. Agree that the evidence of stone sockets is not very strong. In fact, it's downright lousy. 3. I imagine that as we speak, Rob Ixer will be ploughing through a bag of fragments collected from the site. He will be searching desperately for fragments of foliated rhyolite and spotted dolerite -- both of which seemed to me -- on the basis of a superficial examination -- to be missing. That mound is in any case too small to be noticed by anybody who does not have the eye of faith. There is no discernible mound at the position of the eastern recumbent stone. 7. More digging needed next year? OMG -- will this nonsense never stop? 8. Synchroneity of radiocarbon dates around 3,000 BC? The coincidence of some dates around this time is completely meaningless without secure archaeological contexts, and these are completely lacking. Also, we have no control sites to work with -- so the density of dates at Rhosyfelin and Carn Goedog, and their distribution through time, may be no different from the situation pertaining at innumerable other sites in a landscape that was occupied in Neolithic and Bronze Age times. So there we are then. We are not an inch further forward, except that the story has become ever more elaborate and has strayed even further into the world of fantasy. As our intrepid reporter says, we look forward to the specialist studies more in hope than expectation. On one of the TV programs, I think it may have involved Neil Oliver,they were showing how an experimental archeological lady named Jacqueline (? spelling) was cooking a large fish by packing it in clay, placing the package on a fire, and then covering the lot with turves to allow it to slow cook. It was suggested that this was a method used in prehistoric times. If the Neolithic cooks had covered the assemblage with peat squares would they have discovered a neat way of having heat without using wood? Peat = Heat = Neat. Coal drops out n the South Pembrokeshire coast to supersede peat. Coal crops out in the South Pembrokeshire coast (stupid bloody phone). I suspect that this a common clause in leases of the time, in the area, as it would reduce the burning of valuable trees. Not a real point just a thought ------ Was the removal of the peat at Waun Mawn carried out long long ago. I thought that the landlords, the Phillips family of West Williamson, were being very generous to the community but have realised that nearly all the surrounding inhabitants were tenants of his father, John Phillips and therefore no rights given at all. Crumbs from the my table and keep your hands off my trees. My point is that leases, existed in the early nineteenth century, allowing some of the population, in this area, to dig for turf, if they wanted. So it probably happen. As for dating any turf harvesting, I would expect that to be very difficult and that most of any evidence of this, that might of existed, has ended up in a hearth. As a post script, If I was intent on moving many large boulders/monoliths of 'bluestone' to a destination many miles to the south west, for a building project, I would probably scour the southern slopes of Garnwen for suitable material as there is still an abundance scattered about, rather than quarry them from the other side of the mountains. A lot more work! Just a thought? Was Stonehenge an art installation?